Intuit Field Service Management software allows you to connect your back office, QuickBooks, and service techs so you can schedule more jobs, get paid more quickly and increase productivity. It simplifies your business while giving you more control over your people, cash flow, costs and customers ... It’s the answer to the question, “Who’s doing what and where?” and it works with QuickBooks! Go paperless with cloud-based work order scheduling, dispatching, and invoicing for QuickBooks Online and QuickBooks Desktop Pro/Premier/Enterprise. Scroll down for a video demonstration of how Field Service Management works. Prices start at $35. Contact us and we'll get you started with this game changing tool for your business. Prices shown are monthly. No contract required, cancel anytime. You can add dozens of users. Call (303) 801-4772 for a quote. Your Enterprise subscription comes with one user of Intuit Field Service Management ES. 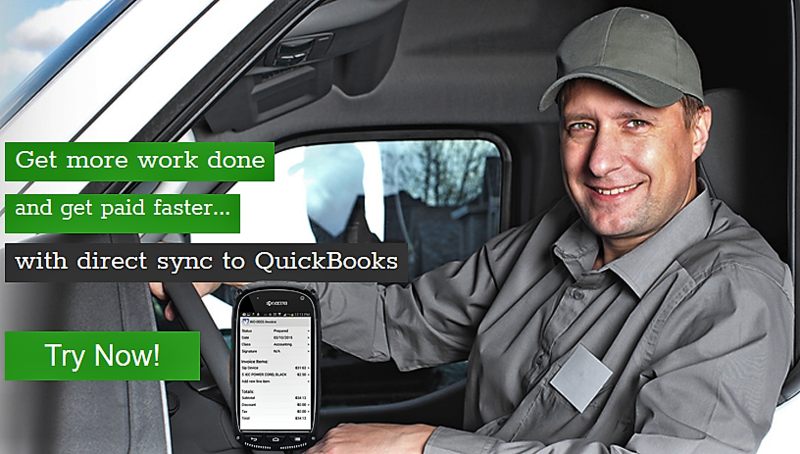 You can integrate the system with QuickBooks and self-assign work orders. Contact Sales when you are ready to add more users to your dispatch board. Worry less about work order status, technician productivity and receivables. Intuit Field Service Management ES simplifies your business and gives you more control over your people, customers, cash flow and costs. Best of all, it works seamlessly with QuickBooks Desktop Enterprise to keep your financial and field service data in sync. Scheduling (or rescheduling) work orders couldn't be easier. Field Service Management ES empowers dispatchers with a dashboard full of information, including each technician's work orders, location, and status. Reassignment and reschedules are fast and easy: When a tech runs late, simply drag and drop the work order to assign the order to a new technician. With Field Service Management ES, you know what each technician is working on, the status, and the duration of the job. You'll also be privy to the technician's arrival time, travel time, and hours clocked. View and edit job details with just a click of the mouse. Store all of the customers, contacts, and equipment information you'll need in order to do the job right the first time. Before a job in the field starts, your technicians will know the service history of the equipment at hand. Valuable information at the fingertips of your technicians means better first-time fix rates — and happier customers. Break through the paper bottleneck. With Field Service Management ES, you can trade in your clipboards for our mobile app running on your Apple and Android phones and tablets — so you control processes and information better. That means immediate information on work orders and technician schedules as well as fast rescheduling. Real-time access to customer history helps you make smarter decisions in the field. Integration with Google Maps allows you to track your workers and locate customer sites easily. The ability to easily shuffle work orders allows you to minimize travel time and get more done each day. Save time and improve cash flow by processing payments in the field using the Field Service Management ES mobile app with the QuickBooks Merchant Services integration. When you process payments with QuickBooks Merchant Services, the payment will be automatically associated with the invoice in QuickBooks. Track truck and warehouse inventory through Enterprise's exclusive Advanced Inventory integration. When you set up Advanced Reporting to manage truck inventory, inventory placed on an invoice is reduced in the invoice synchronization process, eliminating the need to reconcile later. QuickBooks Desktop Pro/Premier/Enterprise version 13 or newer on Microsoft Windows Vista Business 32 or 64 bit, Vista Ultimate 32 or 64 bit, Windows 7/8 Business 32 or 64 bit, or Windows 7/8 Ultimate 32 or 64 bit. Windows Vista "Home Edition" not supported; Windows 7/8 "Home Edition" not supported.